Sydney hotels are well-visited, given the number of tourists that come there every year. One of the ways that hotels in Sydney keep up with customer demands and needs is through bathroom renovations. To turn this into a reality, there are some aspects that they need to focus on. First up is the lighting in the bathrooms. One of the common complains that hotel guests give out is the insufficient lighting in their hotel bathroom. The reason why it is important is that every guest of the hotel has a reason to use the bathroom for grooming. Men need to shave, women need to put their make-up on and blow-dry their hair. A well- lit bathroom is needed. Unfortunately, hotel management usually use dim lights for a sexier effect. One trick that bathroom renovators in Sydney bank on is the Hollywood mirror. It is the type of mirror that has a frame around it with light bulbs. It throws the right amount of light on a guests face on all angles. Next is the color scheme of the counters. A light color on the sink counters adds a beautiful dimension to the bathroom. It goes with any other color. It does not absorb light and instead it reflects it. It makes the room brighter. When it comes to hotel bathroom renovations, more and more hotels are taking out their bathtubs to create more space for their guests to move around. Bathtubs are a romantic feature for couples and a relaxation point for businessmen. But, studies have shown that these are not used that often. In its place, renovators put in larger showers for guests to be comfortable in. Some even put in seating details to accommodate older guests. 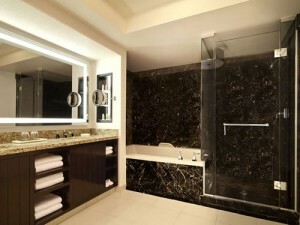 The only concern regarding this aspect of custom bathroom renovations in Sydney is the cost and work involved to do it. Renovators have to deal with the plumbing and tile works of taking out and putting in shower features. Be that as it may be more and more people are just not that into it anymore. The bottom line is that bathtubs are not something that people look for in a hotel bathroom. For this reason alone, a lot of hotel management in Sydney believe it has to go. In its place, rainfall shower heads are being put up. It offers guests that refreshing shower feel that refreshes them. With these three focused upon, hotels in Sydney are actually looking into making their bathrooms more efficient to the needs of their guests.